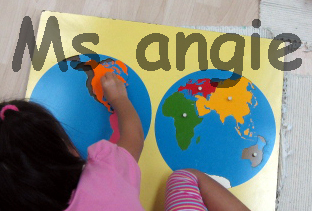 In Montessori School it is very common that all young children know the names of seven continents by working with the Jigsaw Map of the World. Because Maria Montessori thought that it is importnant to have the children learn about the world. Jigsaw Map of the world is one of the material/activities which aim to let children learn the name and give a sensorial impression of the relatives size and shapes of continent. We also have a song during introduce the name of seven continents.